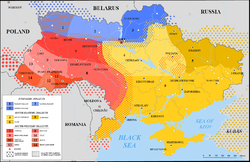 During the Khazar period, the territory of Ukraine was settled by Iranian (post-Scythian), Turkic (post-Hunnic, proto-Bulgarian), and Uralic (proto-Hungarian) tribes and Slavic tribes. Finally, the Varangian ruler of Novgorod, called Oleg, seized Kiev (Kyiv) and established the political entity of Kievan Rus’. Some theorists see an early Ukrainian stage in language development here; others term this era Old East Slavic or Old Ruthenian/Rus’ian. Russian theorists tend to amalgamate Rus’ to the modern nation of Russia, and call this linguistic era Old Russian. Some hold that linguistic unity over Rus’ was not present, but tribal diversity in language was. The era of Rus’ is the subject of some linguistic controversy, as the language of much of the literature was purely or heavily Old Slavonic. At the same time, most legal documents throughout Rus’ were written in a purely Old East Slavic language (supposed to be based on the Kiev dialect of that epoch). Scholarly controversies over earlier development aside, literary records from Rus’ testify to substantial divergence between Russian and Ruthenian/Rusyn forms of the Ukrainian language as early as the era of Rus’. One vehicle of this divergence (or widening divergence) was the large scale appropriation of the Old Slavonic language in the northern reaches of Rus’ and of the Polish language at the territory of modern Ukraine. As evidenced by the contemporary chronicles, the ruling princes of Galich (modern Halych) and Kiev called themselves “People of Rus'” (with the exact Cyrillic spelling of the adjective from of Rus’ varying among sources), which contrasts sharply with the lack of ethnic self-appellation for the area until the mid-19th century.